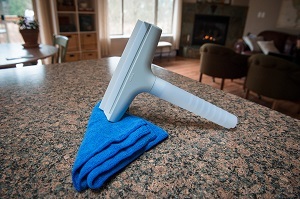 Scoopy Condensation Squeegee is a Must-Have in California! You are here: Home / Featured Products of the Week / Scoopy Condensation Squeegee is a Must-Have in California! With many Californian’s facing drastic cut backs on water use, every ounce counts, and Scoopy is one way that Californian’s can repurpose the condensation left on glass shower enclosures. I received my own Scoopy Condensation Squeegee and I love it! Because the Scoopy has a collection reservoir for water in it’s handle, water squeegeed from a glass enclosure shower stall for example, is collected instead of going down the drain. The water collected is sufficient to water plants or help with other household chores. Now, how cool is that?! What a great way to not waste water! It is also really easy to use! To find out more go to http://www.scoopy.biz/ and you can also order your own Scoopy Condensation Squeegee! Self Disclosure: I received a free sample to facilitate this post.